Are Scorpions Really That Dangerous? Just by the look of it, the scorpion is one intimidating animal. Belonging in the same family as spiders, this arthropod has a pair of pincers and a tail that can deliver nasty stings. So, if you’re asking if these creatures are dangerous, then the answer is – yes, they are. They can pinch you real good with their strong claws, or they can sting you with their stingers right on their curled tails. Whether through pinching or stinging, any way will cause you pain, or at the very least, a mild irritation. However, be wary because there are deadly types out there. Imagine yourself cleaning your garage or maybe stacking firewood, when all of a sudden something stings your hand. You look at your hand, and then you see a scorpion scurrying away. You don’t know what type of scorpion it was, and you’re beside yourself with worry thinking about whether or not you’ve been bitten by a venomous one. Not only is worrying emotionally stressful, but the pain of the sting is also something that’s going to bother you for days. And what if you have babies or kids at home? Are you going to risk having scorpions that could harm them? Also, there are very deadly scorpion species out there. 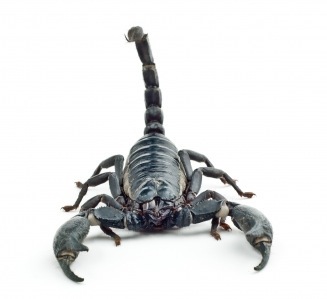 Three of the deadliest are the fat-tailed scorpion, the Deathstalker scorpion, and the Gormar scorpion. The scorpion is indigenous in dry countries, like Saudi Arabia, Pakistan, and the UAE. Again, this kind of scorpion stings; and its stings can inflict not just pain, but a cocktail of really bad neurotoxins. Although a strapping young man will most likely fare well after being stung by a deathstalker, children, the elderly, and those with pre-existing medical conditions could die from this scorpion’s stings. Still, it’s better to just stay away from it; its name just says it all. It’s not gory. Its gleaming dark-as-night body and red-tinged legs make it look like the spawn of the dark side. The creature is imposing, about 4 to 5 inches in length, making it one of the largest scorpions around. The gormar scorpion has a bulky body, fat pincers, and a fat, venomous tail. There’s still no exact anti-venom for this type of scorpion. So, it’s best to avoid this creature. Be extra careful when you’re traveling the jungles of Venezuela, especially if you’re one with a penchant for exploring rainforests as you might meet this dreaded creature. Most of the time, scorpions sting instead of pinch. They sting other creatures, including man, if they perceive them as threats. In their defense, these arthropods don’t actively seek people just to sting them. You will most likely get stung if you disturb their habitats. The problem here is that a lot of scorpions have taken to human habitation as well. Scorpions, which have lost their homes because of developments or other activities, have found their way in small communities and even thriving cities. So, what do you do in case you get stung? The first and most important thing that you should remember is – avoidance. Don’t go near a scorpion if you don’t know what type it is. Although only about 25 of the many species are known to be extremely venomous, you don’t want to risk your life, right? Secondly, in case you get stung by an unknown scorpion, seek medical help as soon as possible. Even though there are no known antidotes yet for some of the most lethal species, it’s still best to get expert medical assistance. Doctors can help those having breathing difficulties. They also use emergency meds, like epinephrine, for those who experience severe allergic reactions or anaphylactic shock to scorpion stings. Third, protect those most at risk, like babies, children, older people, or those with medical conditions. Fourth, protect your home. Call professional exterminators to help you if you notice a scorpion infestation. Photo courtesy of Nuttapong at FreeDigitalPhotos.net. Claire Clarke writes for several Indianapolis Pest Control companies. She blogs about pest management and pest eradication. Yes, it sounds like you have had your fair share of insect encounters there buddy. I once had a flying cockroach land on my tie and was milling around trying to shake it off without touching it, much to the amusement of people around me. This was in Thailand and I couldn’t speak the lingo back then, so I wonder if they didn’t know about the cockroach and instead just saw a raving mad lunatic flapping around a tie and jumping up and down? That’s quite an intimidating picture of a Scorpion!! !